The claimant count records the number of people receiving unemployment benefits from the government. 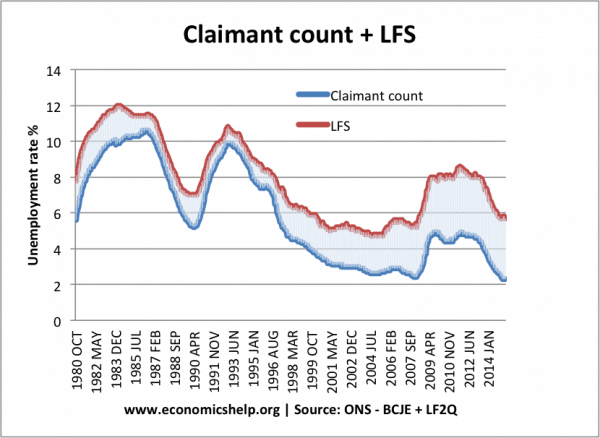 In the UK, the claimant count currently measures everyone who receives Job Seekers Allowance (JSA). To receive JSA, the applicant must be actively seeking work and provide evidence and commitment of efforts to find work. The claimant count method is one of two main measures of unemployment. The other method is the ILO Labour Force survey of unemployment. In recent decades, the gap between the claimant count method and the Labour Force method has widened. This reflects the fact that it has become more difficult to receive Jobseekers allowance (JSA. Therefore, people may be classed as unemployed (actively seeking work), but not entitled to JSA. People who are not able/willing to visit the local job centre every week and meet criteria for actively seeking work. People who left their previous job voluntarily. People who are on training schemes. Students looking for vacation work. Income-based JSA is means tested. People with savings of over £16,000 or cash income can be denied means-tested JSA. Income-based JSA includes examining the income of parents if you are under 24 and live with parents. Contribution-based JSA is dependent on whether you have paid enough class I NI contributions in the previous two years. If you have not paid enough NI, you will not be entitled to this. People who chose not to apply for benefits and sign up to the JSA commitment. In July 2015, UK claimant count was 2.3% – yet, the UK economy is far from full employment – given interest rates at 0.5% and CPI inflation of 0.5%. The claimant count method is under-estimating the true level of unemployment because many people are actively seeking a job, are not eligible or do not feel it is worth doing. Changes to benefit criteria can lead to fluctuations in the rate, not related to changes in unemployment. Since 1991, the gap between the Labour Force Survey and the claimant count rate has widened due to changes in the criteria for receiving unemployment. 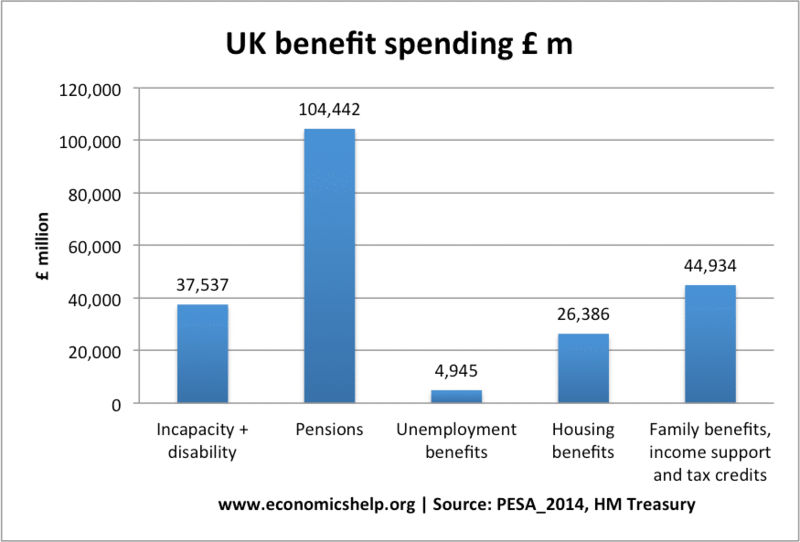 Unemployment benefit spending compared to social security spending. 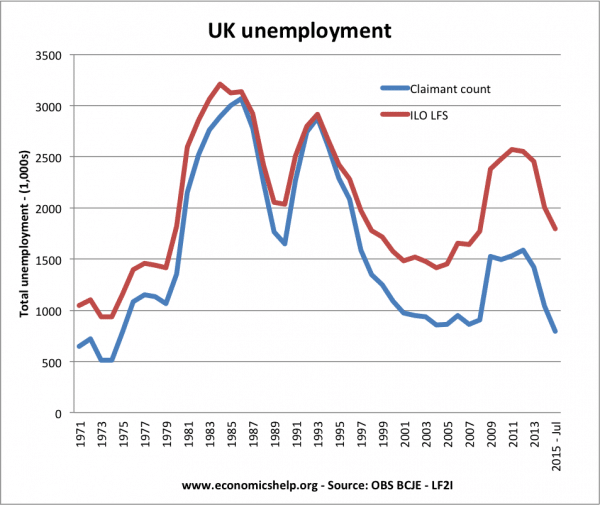 It is possible that the claimant count could overstate the level of unemployment because people could collect JSA while also having a job. 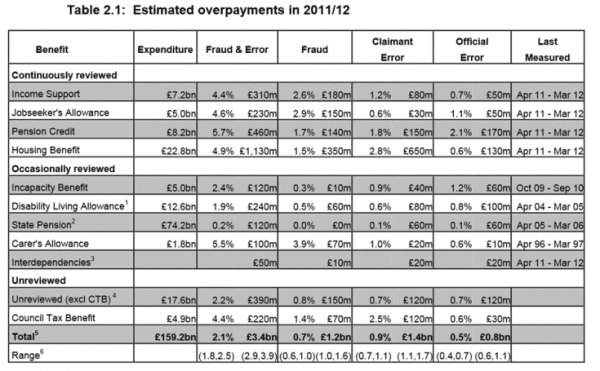 However, the levels of estimated benefit fraud are quite low.